A ray of sunshine amid the economic gloom: While some solar companies struggle through the downturn, BrightSource Energy on Wednesday morning announced the world’s largest solar energy deal to date – a 20-year contract to supply utility Southern California Edison with 1,300 megawatts of greenhouse gas-free electricity. That’s more than twice the size of the previous world’s-biggest-solar-deal, a 553-megawatt power purchase agreement in 2007 between California utility PG&E and Israel’s Solel. BrightSource itself last year inked a deal to provide PG&E (PCG) with 500-megawatts of solar electricity with an option for 400 megawatts more. Oakland-based BrightSource will build seven solar power plants for Southern California Edison (EIX) using its “power tower” technology. 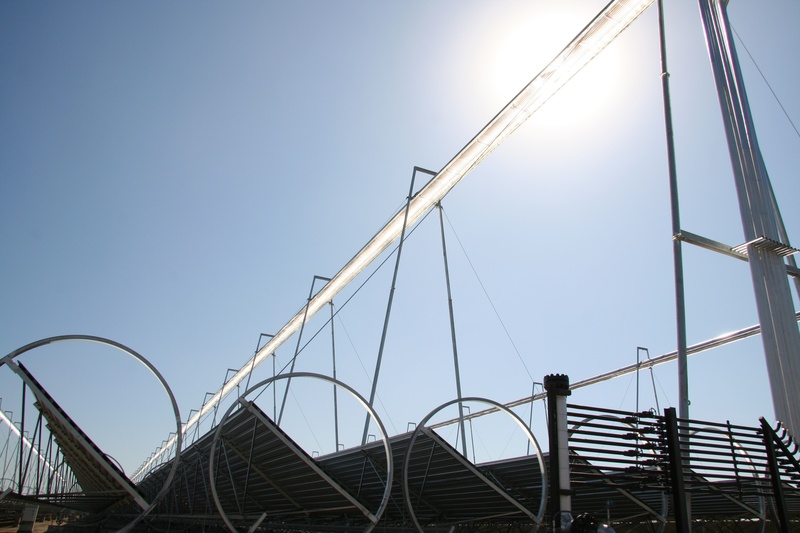 Thousands of sun-tracking mirrors called heliostats focus the sun’s rays on a water-filled boiler that sits atop a tower. The intense heat creates steam which drives a turbine to generate electricity. BrightSource has built a prototype power plant in Israel. BrightSource has raised more than $160 million from a blue-chip group of investors that includes Google (GOOG), Morgan Stanley (MS) and VantagePoint Venture Partners as well as a clutch of oil giants – Chevron (CVX), BP (BP) and Norway’s StatoilHydro. If all the solar power plants are built, BrightSource’s deal with Southern California Edison will generate enough electricity to power about 845,000 homes. The agreement is a vote of confidence in the solar industry at a time when the financial crisis has forced BrightSource rivals like OptiSolar to lay off workers while Ausra retools its strategy to focus on supplying solar thermal technology to power plant developers rather than building projects itself. Given the economic collapse, why are these massive megawatt deals still being done? First, California utilities are under tight deadlines to ratchet up the amount of electricity they obtain from renewable sources – 20% by the end of 2010 and 33% by 2020. Second, it costs nothing to sign a contract – no money has yet changed hands, and won’t unless the plants are built and begin producing electricity. In fact, not a kilowatt of juice has been generated from the more than 5,000 megawatts of Big Solar contracts signed over the past four years by California’s three investor owned utilities (the third being San Diego Gas & Electric (SRE) ). Still, a long-term utility contract is key for a startup like BrightSource to obtain the billions in financing required to build large-scale solar power plants. The terms of utility contracts – such as the cost of the solar electricity produced – are closely held secrets but are worth billions, if a 2008 power purchase agreement between Spanish solar company Abengoa and utility Arizona Public Service is any guide. A significant hurdle for BrightSource – and many other solar developers – is the expansion of the transmission grid to connect remote power plants to cities. BrightSource spokesman Keely Wachs says the company has 4,200 megawatts of solar power plant projects under development. The Southern California Edison deal is something of a homecoming for American-Israeli solar pioneer Arnold Goldman, BrightSource’s founder and chairman. In the 1980s, during the first solar boom, his Luz International built nine solar power plants in the Mojave. Those plants, most are now operated by FPL (FPL), continue to provide electricity to Edison. The first BrightSource solar farm for Edison is expected to go online in early 2013. It’s a 100 megawatt power plant part of BrightSource’s Ivanpah complex to be built on federal land on the California-Nevada border in the Mojave Desert. That plant is currently wending its way through a complex state and federal licensing process. Just how complex was illustrated by a meeting Green Wombat attended Tuesday in Sacramento, where a roomful of state and federal officials spent hours discussing the environmental impact of a 750-megawatt solar power plant to be built by Phoenix’s Stirling Energy Systems for San Diego Gas & Electric that would plant 30,000 solar dishes in the desert. A second Stirling solar farm will be built for Southern California Edision. When the deals were announced in 2005, they were the world’s largest at the time. PG&E chief executive Peter Darbee recently said his utility will begin directly investing in solar power projects. On Wednesday, Southern California Edison renewable energy executive Stuart Hemphill said Edison would consider requests from solar power developers to take ownership stakes in their projects but prefers to sign power purchase agreements. “We do see solar as the large untapped resource, particularly in Southern California,” said Hemphill.